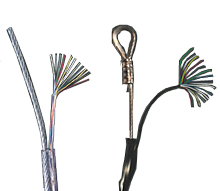 Many types of metals are used for thermocouples in various applications; however, copper and constantan are the most practical type for temperatures below 600 Degrees F. The Constantan is an alloy approximately 57% copper and 43% nickel along with the junction of copper is called a type T thermocouple. All of the Rolfes Temperature Cables are manufactured with this process and are made in the USA. These are available in bulk or custom made to the customer's specification.